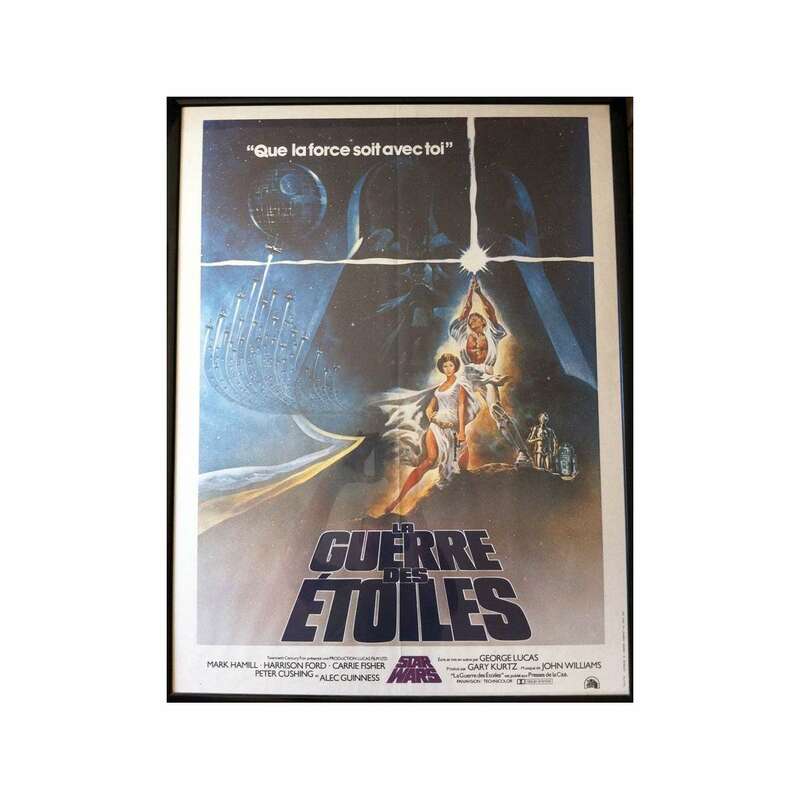 > Archives>STAR WARS French 24x32 movie poster '77 George Lucas classic! 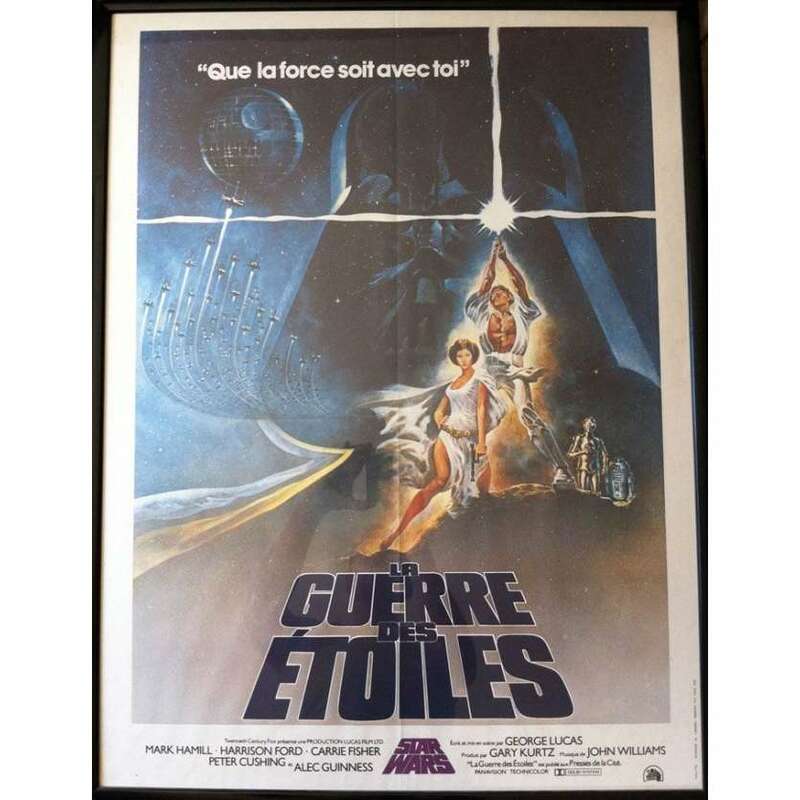 STAR WARS French 24x32 movie poster '77 George Lucas classic! Star Wars Episode IV: A New Hope, originally released as Star Wars, is a 1977 American epic space opera film, written and directed by George Lucas. It is the first of six films released in the Star Wars saga: two subsequent films complete the original trilogy, while a prequel trilogy completes the six-film saga. It is the fourth film in terms of the series' internal chronology. It stars Mark Hamill as Luke Skywalker, Harrison Ford as Han Solo, Carrie Fisher as Princess Leia and the great Alec Guinness as Obi-Wan "Ben" Kenobi. Set "a long time ago in a galaxy far, far away", the film follows a group of freedom fighters known as the Rebel Alliance as they plot to destroy the powerfulDeath Star space station, a devastating weapon created by the evil Galactic Empire. This conflict disrupts the isolated life of farmboy Luke Skywalkerwhen he inadvertently acquires the droids carrying the stolen plans to the Death Star. After the Empire begins a cruel and destructive search for the droids, Skywalker decides to accompany Jedi Master Obi-Wan Kenobi on a daring mission to rescue the owner of the droids, rebel leader Princess Leia Organa, and save the galaxy. Important Added Info: Note that this poster was folded at one time but has been laying flat for a long time and will be sent rolled in a tube.